Sometimes stress goes right to your stomach! A few years ago, my husband was having a stressful time at work, due to events beyond his control (a common cause of stress in the workplace!). As a result, he started to experience a type of indigestion that can best be described as tightness in his stomach. Of course, this only added to his stress, since it became difficult for him to eat and sleep properly. I did some research and found out about the positive effect of black licorice on the digestive system. My husband actually is quite fond of black licorice, and we occasionally will buy a brand called, PANDA licorice, which is sweetened with molasses and very tasty. However, because of the sugar content and the potential effect on his blood pressure, I got him a product called DGL (Deglycyrrizinated Licorice), that is, black licorice with the glycyrrhiza component removed, which is the component in large doses that could lead to high blood pressure. DGL comes in chewable tablet form, which makes it easier to regulate the dose. Ideally, DGL should be taken about 20 minutes before you eat, but if your stomach begins to bother you after eating, you can take it whenever the symptoms occur. Caveat Regarding Licorice for Digestion: Keep in mind that so-called "red licorice" is not really licorice, and does not have this positive digestive quality! There are also some good teas you can buy that have licorice root in them. My particular favorite is a YOGI brand tea called “Stomach Ease.” This tea also includes ginger, another herb that is a digestive aid. You will be happy to hear that my husband’s work problems and subsequent stomach problems have been resolved. We still keep some DGL around, though, just in case! We also enjoy eating PANDA black licorice, occasionally, knowing it is having a positive effect on taste buds and our digestion! Click on the links below for previous Healthy Eating Tips. Healthy Eating Tips: Choosing and eating ice cream. Healthy Eating Tips: Grocery Shopping. Healthy Eating Tips: Conscious Eating. Healthy Eating Tips: Cinnamon Ideas. Healthy Eating Tips: Whole-Wheat Pasta. 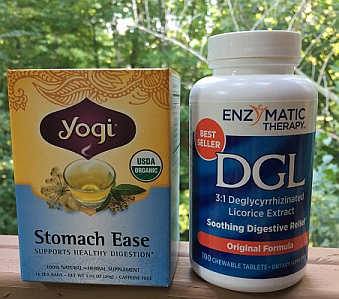 Click here to go from Licorice for Digestion page to Drinking with Meals page.